Customizr is a free WordPress them that can be used to create just about any type of website. You can easily install beautiful WordPress layouts for your business, blog, portfolio, landing pages, forums, shopping site and more. Customizr features a live preview option, so you can instantly see your design changes as you customize your layout. Even if you don’t have a clear idea about how you want to customize your template. Customizr provides all sorts of ways to augment the look and feel of your site. Many times developers take this a step further by making more specific changes. With the use of a child them, Customizr aids this process with an extensive set of Snippits. This fully responsive, feature-rich theme makes customization simple as a click, drag and drop. More advanced users with knowledge of PHP can manipulate this theme in a variety of ways by modifying the code. Display vibrant high quality pictures in the slider area, which is full width and looks perfect any device. You can choose to insert your own unique log or a boxed image to display. Adding audio from sound cloud or by upload couldn’t be simpler. Another favorite feature of ours is the customizable grid for blogs. This free WordPress theme is great for beginners, intermediate or advanced WordPress users. It doesn’t take a whole lot of technical knowhow for novice developers to change the layout via the WordPress customizer. As the name suggests, Customizr makes customizing your designing your layout simple. This free WordPress theme offers a few column layout options as well. You’ll have access to simple solutions to monetize your site, integrate a shopping cart or crate user accounts. 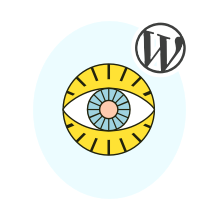 The WordPress dashboard, typically called the “backend,” is the control center that has everything you need to setup your site. You can easily install users to edit and add content to your site. There are a number of powerful built-in functions. Add more options for your visitors by creating a call to action button. You have a few options for placement with Customizr’s slidebar generator homepage. Create user accounts, easily adjust typography or add password protection to give your users a richer experience.